On Australia Day this year, more than 17 000 people from 145 countries took the pledge and became Australian citizens. Prime Minister Julia Gillard, presiding over a ceremony in Canberra, told the crowd that the first citizenship ceremony was in 1949, and since then more than 4 million people had sworn loyalty to Australia. In fact, Ms Gillard was one of them – she was born in Wales and moved to South Australia as a child. 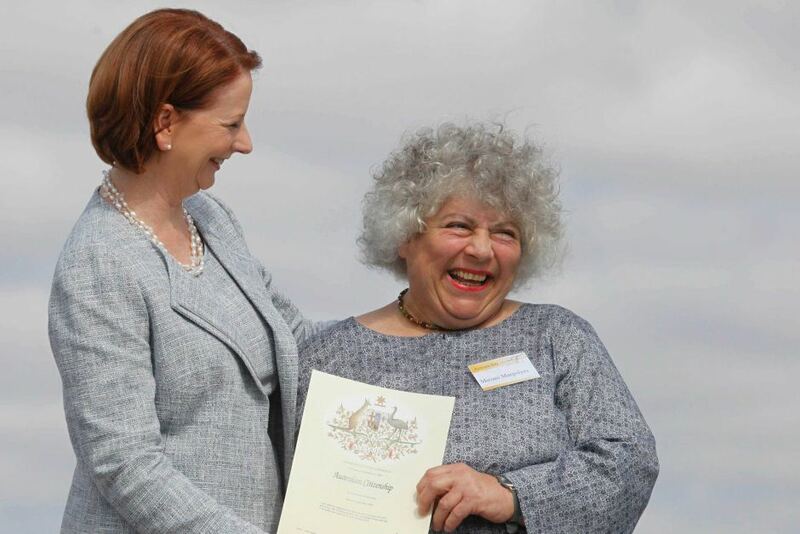 Amongst the 17 000-odd people becoming Australian citizens was British-born actress, Miriam Margolyes. Miriam has long been a mainstay in film, television and theatre, delighting audiences in such favourites as Blackadder, Little Dorrit, Babe, the Harry Potter films (she played Professor Sprout), and Wicked. A massive Charles Dickens tragic, Miriam has taken her one-woman show, Dickens’ Women, all over the world. Miriam apparently got a bit of a crush on Australia when she was only a child, and kept on meeting wonderful Australian people, until at last, in 1968, she met her Australian partner Heather, which cemented the deal for good and all. She bought a house in the southern highlands of New South Wales around the time she was in Babe, and for many years now has been based in Australia. Miriam promised that she hasn’t become Australian just for the beach and barbies, she wants to make a contribution to Australian society. Although she loves her country, she plans to use her democratic right to protest and speak out against things that need to change, and also wants to learn more about disadvantaged Australians. In other words, she will be a fantastic Aussie citizen. Miriam is the original name on which the familiar Mary is based. In the Old Testament, Miriam is the older sister of Moses, and it is she who came up with the clever plan to save her baby brother’s life. Because Pharoah had decreed that newborn Hebrew boys were to be killed, she took Moses and hid him by the side of a river. She secretly watched as Pharoah’s daughter found and adopted him, then suggested that the princess use Miriam’s mother as a wet nurse, so that Moses was cared for in his infancy by his own family. The Old Testament depicts Miriam as a strong, outspoken woman, and a leader amongst the Hebrews. One of the oldest parts of the Bible tells how she led the women in triumphant song and dance after the crossing of the Red Sea, the female chorus echoing the men, who were led by Moses. She was a prophetess, with the Bible implying that God spoke to her through dreams; the Bible speaks of the prophets Moses, Aaron and Miriam as if all three of them played vital roles in the Hebrews’ escape from Egypt. According to Jewish tradition, the Hebrews were blessed by a well which followed them through the desert due to Miriam’s righteousness. When she died and was buried (in present-day Syria), God caused a spring of abundant fresh water to open up for the people. The spring was called Meribah, which means “quarrelling”, as everyone was grumpy from thirst. This story is very similar to another where the Hebrews were suffering from severe water shortage, only to find a well filled with bitter water. Moses turned the brackish water sweet with a particular tree, but the well was still called Marah – “bitterness”. These two stories probably help to explain two suggested Hebrew etymologies for the name Miriam – “rebellious”, and “bitterness”. These are generally thought to be unpleasant meanings for a girl’s name, but as you can see, the stories were positive ones, although they don’t actually have anything to do with Miriam. In fact, it’s unlikely that Miriam’s name was Hebrew at all – she was born and raised in Egypt, and it is believed that both her brothers’ names were of Egyptian origin. Miriam may be derived from the Ancient Egyptian word for “love” or “beloved”, or it could be a form of the Ancient Egyptian name Meritamen which means “beloved of Amun” – Amun was the chief god of the Ancient Egyptians, and his name means “hidden”. For this reason you will sometimes see Miriam and Mary translated as “beloved by God”, even though it doesn’t mean the God of the Abrahamic religions. Miriam has never disappeared from the charts, but never been in the Top 100. It was #133 in the 1900s, which is the highest point it ever reached; its current rank of #458 is the lowest it has ever reached. After climbing steeply in 2009, the name Miriam fell dramatically in 2011 – although in real terms, that equates to just ten fewer babies called Miriam than there were in 2009. I think the name Miriam has much to recommend it. It’s an underused classic, which means it’s familiar to everyone, yet rarely encountered. It is feminine, strong, sounds quite intellectual, and suits any age. In Jewish tradition Miriam was associated with water, and I do think Miriam has a liquid feel to it – cool and deep. It has a range of possible nicknames, including Mim, Mimi, Mima, Minnie, Mirri, Mirra, Mira, Mia, Mitzi and Remi. Even a murderous Norah Jones sang that Miriam was “such a pretty name“. When your most vengeful enemy admits you’ve got a nice name, that takes some beating. POLL RESULT: Miriam received an astounding 91% approval rating, making it one of the highest-rated names of the year. Miriam was praised for being strong and intelligent (45%), pretty and feminine (23%), having great nickname options (15%), and a desirable level of popularity (8%). However, 8% thought the name was too old-fashioned. Nobody thought that the name Miriam was “too Jewish”. I really like the name Miriam, I know several girls my age who have this name. I really like it too – I know two Miriams, one is in her early 20s and the other in her early 30s, and they are both pretty and smart. In English, more like MIR-ee-uhm. You can hear the English pronunciation here; I say it exactly the same as the second person from the United States.